Previous students attend these schools: Bourne Grammar School, Stamford Endowed Schools, Oakham, Oundle, Witham Hall, King's School Peterborough, and Home Schooled. Here are the answers. 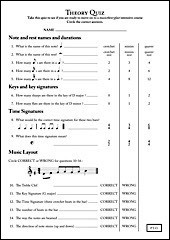 If you need more practice, you might work through a Music Theory Workbook. I recommend the Theory of Music Workbooks by Naomi Yandell, published by Trinity College of Music, London. The Grade 3 workbook is very useful. Also, I would encourage students to wait until they are at secondary school. Also, age helps: gifted primary school children might understand the concepts, and may scrape through the exam. However, younger children tend not to have experience in exam techniques, and in my experience do not retain a sufficient grasp of theory beyond the exam. I would encourage students to wait until they are at secondary school. Most of the previous course participants have been in KS3 and 4, School years 7 - 11, and adults.